Effectively reduces lead to below 15 ppb (EPA standard for Drinking water). 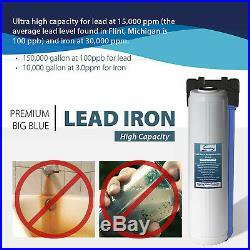 Ultra high capacity at 15,000 ppm for lead and 30,000 ppm for iron. Stable and satisfactory performance at wider ph range 5 – 9 and temperature range 40 – 120F. Lasts up to 3 times longer than conventional media. Delivers high flow rate & very low pressure drop. Safe for Drinking water applications. The FCRC25B is an R/O prefilter and drinking water cartridge constructed totally of FDA grade materials and media. It will remove lead and other heavy metals from feed streams and demonstrates a capacity of 2500 ppm gallons, even in hard water. The FCRC25B can also be used to remove iron as an R/O prefilter with exhibited capacities for iron in excess of 5000 ppm gallons. This can eliminate iron fouling and remove metallic tastes in drinking water caused by iron, copper or galvanized pipes. Other metals removed by the FCRC25B include potassium, cesium, magnesium, calcium, strontium, barium, radium, chrome +3, manganese, iron, nickel, copper, silver, zinc, cadmium, mercury, aluminum, tin, and lead. Dimensions: Length = 20 IN, O. = 4.5 IN, I. = 1 1/8 IN. Feed Water Temperature: 40 – 120 F. Feed Water Pressure: 20 – 100 psi. Pressure Impact: up to 5 psi drop at a flow rate of 4 GPM. Flow rate: 3 – 4.5 GPM. Filter life: 15,000 ppm for lead, 30,000 ppm for iron (150,000 gallon at 100ppb for lead; 10,000 gallon at 3.0 ppm for iron). The lead & iron reducing filter #FCRC25B’s capacity for iron is much lower than the capacity for lead. Depending on the amount in your water, the filter may lose effectiveness in removing iron before the life of the filter expires. If iron is the main concern, you may instead want to look at using a filter specifically for iron such as the #FM25B, which is also included in our whole house systems #WGB22BM and #WGB32BM. We guarantee the performance of our water filter systems. We carry all parts and components. One-year limited warrantee for parts and components (excluding the replacement filters). Only 2-day transit time for most states in Eastern Time zone and part of Central time zone (including Texas). Located in Atlanta, Georgia, we are specialized in Reverse Osmosis system and its components for both residential and light commercial water treatments. Our products range from Reverse Osmosis (RO) Systems, Whole house water filter, RO Cooler, Shower filters, Counter Top Filter Systems, Filter Cartridges, Filter Housings, Faucets, Fittings, and other accessories. Our aim is to bring clean, pure, and fresh drinking water to more industries and households. 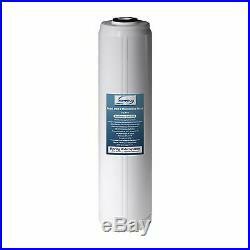 The item “ISpring Lead/Iron Removal Whole House Big Blue Replacement Filter 4.5” x 20′” is in sale since Tuesday, November 27, 2018. This item is in the category “Home & Garden\Home Improvement\Plumbing & Fixtures\Water Filters”. The seller is “ispringwatersystems” and is located in Alpharetta, Georgia. This item can be shipped to United States.